When you cook with wine or spirits, when does the alcohol cook away? Obviously high temperatures will do it, but how low of temperatures will work? Also, does it vary by the type of alcohol? You will never fully cook away alcohol, only reduce the amount. See Alcohol retention in food preparation, or for the quick table, see wikipedia. They covered this on an episode of America's Test Kitchen, and concluded that surface area matters -- a wider vessel would cook off more alcohol; it wasn't just a function of time. 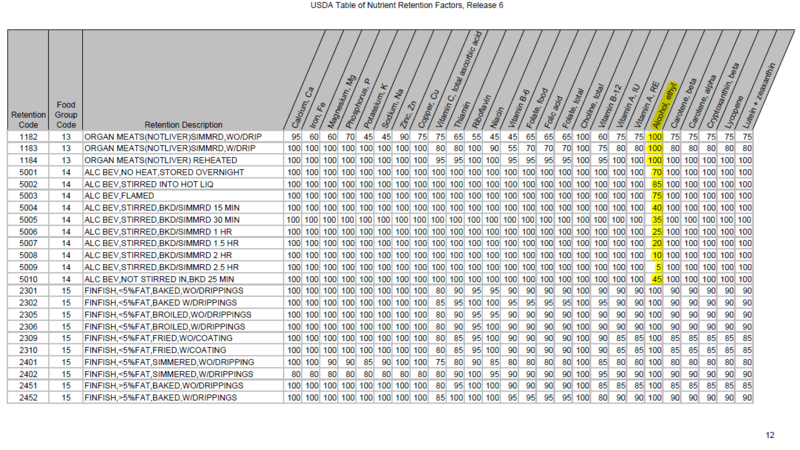 These data come from the USDA Table of Nutrient Retention Factors Release 6 [PDF]. The information is in the table on page 12 of the document (page 14 of the PDF file). In case that link goes dead (sorry that the screenshot is somewhat small). If you add alcohol, some alcohol will remain indefinitely (or at least as long as the food is not a lump of smoking carbon). The proportion of alcohol to water-based liquids will shrink over time, however. (I'm assuming heat here: if there is no heat, or high pressure, then the proportion will remain stable for quite a while). Alcohol evaporates at about three times rate of water (or to be more precise, the latent heat of evaporation for Ethanol is at 846(kJ/kg) vs water which is at 2257(kJ/kg)) but this relation doesn't hold for the proportion that will be found in your food due to atmospheric pressure and air saturation and exposed surface area...It's actually extraordinarily difficult to work out. Roughly speaking, though, if you reduce your liquid volume you're burning off alcohol at a higher rate than water. So things that are reduced substantially will have proportionately less alcohol in them, than things that are not (all other factors being equal). Typically when you're "cooking" with alcohol it's as a sauce or a glaze, both of which require fairly high temperatures and would typically be done in a pan on the stove or in the oven. As you go lower with the temperature it's going to become more of a mixed result. Some amount of the alcohol (say, the part closest to the heat source) will burn off, but some will remain. Without more specific information about what you're trying to cook and/or accomplish it's hard to say what will work for your situation. According to Wikipedia ethanol (which is the alcohol in wine or spirits) boils at 78.4 °C. Assuming that the ethanol hasn't made a chemical connection with something in the alcohol or food, cooking at 78.4 °C for a 'sufficient' period of time, should remove any trace of ethanol. It is important to note that the table accompanying the USDA Table of Nutrient Retention Factors Release 6 December 2007 lists a amazing number of foods--all have 100% Ethanol retention levels for the listed food item and cooking method. Only ALC Beverages listed and simmered as described on page 12 of the table (items with Retention Codes 5001 through 5010) have the decreasing retention percentages listed by BobMcGee and merl. I had long assumed sufficient heat of sautéing, frying or baking removed most if not all ethanol. I am astonished to discover otherwise. If the sauce/soup/etc is above the boiling point of ethanol (about 173 F or 78.4 °C) the ethanol will boil out almost immediately. It can't remain in solution at temps above the point where it becomes a gas. The other flavors, sugars and spices and all, will remain. Ethanol can't remain a liquid at 212 F or 100 C - physically not possible. I don't care what Wiki says in this case. Moments after passing 173 degrees, all the ethanol evaporates from the solution, it has to. Not the answer you're looking for? Browse other questions tagged alcohol food-science or ask your own question. What is a substitute for red or white wine in a recipe? why add a shot of vodka to a cream sauce? what is a good liquid to replace tequila with? What are some good substitions for alcohol in cooking? Cooking alcohol: how many calories are lost? Can Rum-balls be made without alcohol? How to remove alcohol taste from vanilla extract? How should I add wine to the sauce for my duck? Does the alcohol in wine affect cooking process? Does adding alcohol to dough prevent it from soaking oil when deep-frying? Non-alcoholic substitution for dry white wine in bolognese sauce and other tomato sauces? What types of alcohol will make meat tender when marinating? Does pressure cooking preserve alcohol? Microwaving wine to remove alcohol? Keep alcohol in spiced rum reduction?